danger garden: It's holiday wreath season! This decorated twig wreath hangs on our front door. The ornamental additions include two kinds of Magnolia leaves, small Grevillea australis and Eucalyptus branches, Lunaria seed pods, Holly cuttings and unknown conifer bits (collected by me from trees in a nearby field). The bare twigs are a nice contrast to the opulence. The back door (where we tend to come and go) got a grapevine wreath dressed up with more Magnolia leaves and Doug Fir cones. The wreath is a little undersized but I had it on hand so I used it anyway. The copper fuzz on the underside of Magnolia leaves is a favorite feature. I still have last year's moss wreath and briefly thought about taking it to the party for "sprucing up" instead it stayed home. It has been put to use on the backside of our front door. The once bright chartreuse moss is faded, but still fun. This olive wreath was built on a single piece of metal, formed into a ring, that I found in the street (on a dog walk). Rather than make bundles of olive branches — for a thick and full wreath — I instead just wove long stems around and around, letting them project out in a random fashion. A few olives dropped in the process but quite a few remain. This one gets pride of place above the mantle, other holiday decorations were soon added. I think I've shared this photo here before, but just in case, Andrew brought it home from work (Schoolhouse Electric) where it had been acting as a prop. I wish I knew the story behind the smiling couple and why they're posing in the Opuntia patch. I made one more wreath, this a small one consisting only of Magnolia leaves. I had a hard time deciding where it should live, and it hung here on the bookcase (vasecase?) for a day or two. Problem was you didn't really see it. So it moved over to the fireplace and hangs there, below the mantle. Have you made any wreaths yet this season? Weather Diary, Dec 3: Hi 47, Low 39/ Precip .07"
I haven't made any wreaths, but I really like that last one, with the Magnolia leaves that shows the backs of some of them. Nice and simple. Perhaps it's time to make yourself a Magnolia leaf wreath? On the other-hand I've seen some lovely ones at the nurseries this year. Buy yourself one! They're all great but I especially like the bare branches on the front door wreath. My nephew used to sell evergreen wreaths when he was in Scouts. I would always buy one, take off all their junk, add more greens from my garden and then whatever else inspired me that year. He's out of scouts, so I have not done a wreath in a few years. But the front door area does need something. Temps are about to take a dive, so I should have done it while we were having a warm spell. "take off all their junk, add more greens from my garden and then whatever else inspired me that year"...ha! We're so very alike in some ways. I think I've done that with any evergreen wreath that someone has bought for me. Making wreaths is fun, especially in company of like-minded friends. Good times. The most surprising to me was the olive branch wreath. Since November was so incredibly wet and an olive branch symbolized the end of the biblical flood, I'd say that is my favorite wreath. This was my first group wreath making experience, something I would definitely do again. I like your interpretation of the olive wreath! Wow, you really went to town with the wreaths! Your first wreath works beautifully against the backdrop of your bright green front door. It's hard to pick a favorite as they're all so different but the olive branch wreath really grabbed my attention. I've put wreaths (and garlands) on hold until we get through this week's wind event, which is expected to cause yet another drop to single digit humidity levels - I don't want everything to dry out before Christmas! Ya we've got the wind coming here too, and with the drop in temperatures it's going to be painful to the skin...maybe even freeze drying to some foliage. On the other hand it stirs things up and keeps the temps from really plummeting. Would the couple posing in front of the giant opuntia be considered a prickly pair? Love all of your wreaths but the little magnolia leaf charmer makes me smile. A swell combination of shiny green and fuzzy cinnamon. I haven't started decorating at home for Christmas yet but my classroom is looking pretty festive. Oh you're a clever one Mr Outlaw. And I'm sure your students appreciate your classroom decorating. I'm especially charmed by the Olive wreath...anxious to see what joins it on your mantlepiece. I'm waiting for that sunshine the forecasters are promising and then I'll be snapping some mantle photos — it's been so dark that it's nearly impossible to do so. I haven't made one wreath. Seeing your creations makes me want to make one. I don't think I have any nice greenery to make one. I used to make a lot of decorations with the pine tree in our garden. It died in the drought this summer. I miss it's piney offerings. I have put other greens into pots. I need to collect some holly berries from a friends garden to finish them off. I hope you get some holly and find some greens to work with. Here a windstorm like they're predicting for this week usually sends conifer greens falling from the sky. I'm so impressed with your focus energy level! It would take me a whole day to make one wreath, and you've made how many? Olive tree in your neighborhood?!? The couple in the Opuntia patch is a kick. Be fun to have a shot of you, Lila, and Andrew in an Opuntia patch as a companion piece. The reflection photo is super cool. Naw, these were easy ones...you could have done them in a couple of hours too. The olive tree is a few miles away, but my former plantlust.com partner Patricia does have one in her garden, which is kinda my neighborhood. These are beautiful, Loree. 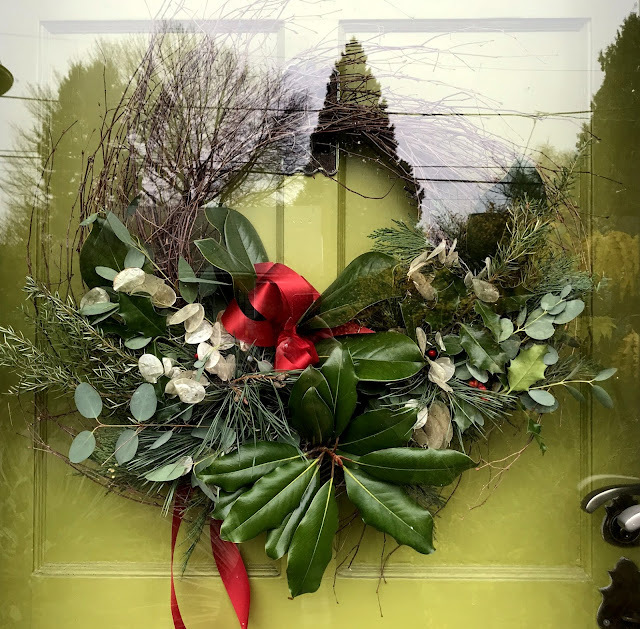 I love handmade wreaths and am fond of the cinnamon-backed shiny-green magnolia leaves, they are unusual and make a bold statement in arrangements.